Korematsu Day underlines the need to stop racial profiling | Jon Katz, P.C. With such a dizzying pace of worthwhile annual events in the Washington, D.C., area, not missing information about them would be like a full time job. That is how I missed knowing Fred Korematsu had made appearances in Washington, D.C., prior to his passing in 2005, despite my having learned about his Supreme Court battle by the time I was in high school. Fred had the guts to defy president Roosevelt’s executive order for ethnic Japanese people in California to report to concentration camps. He got convicted for refusing the executive order, and the Supreme Court’s six-member majority lacked the guts to overturn his conviction, instead handing concentration camp power to wartime presidents on a platter, which is all the more scary when considering that none of our many wars since the second world war has been declared by Congress in conformity with the United States Constitution. Decades later, President Ronald Reagan issued an apology for this travesty of justice and human rights. Ten years after her father’s passing, on January 29 I met Fred’s daughter Karen Korematsu, pictured above with me, who carries on the work to keep alive the story of Fred and World War II American concentration camps of ethnic Japanese people, so that racism will end, during this political climate of racial profiling of Muslims as potential terrorists and where in this day where leading GOP presidential candidate Donald Trump speaks out of both sides of his mouth at once not liking the concentration camps but not ruling out supporting them had he been a government leader during World War II, and of course continuing to promote bans on Muslims entering the United States. January 30 is Fred Korematsu Day, and this year it is being celebrated officially in Virginia for the first time, after the Virginia legislature unanimously passed a resolution designating January 30 Fred Korematsu Day of Civil Liberties and the Constitution. Learning only this morning that Karen Korematsu would be at the Northern Virginia celebration of Fred Korematsu Day, before jetting back to California for the next day’s events, I cleared my after-hours calendar to be there. I am only starstruck by a handful of people, including the late Justice William Brennan and piano legend McCoy Tyner. Add Karen Korematsu to the list, even though I admit that her lineage from Fred Korematsu and work to educate people about his story and the concentration camps was enough to create that awe. 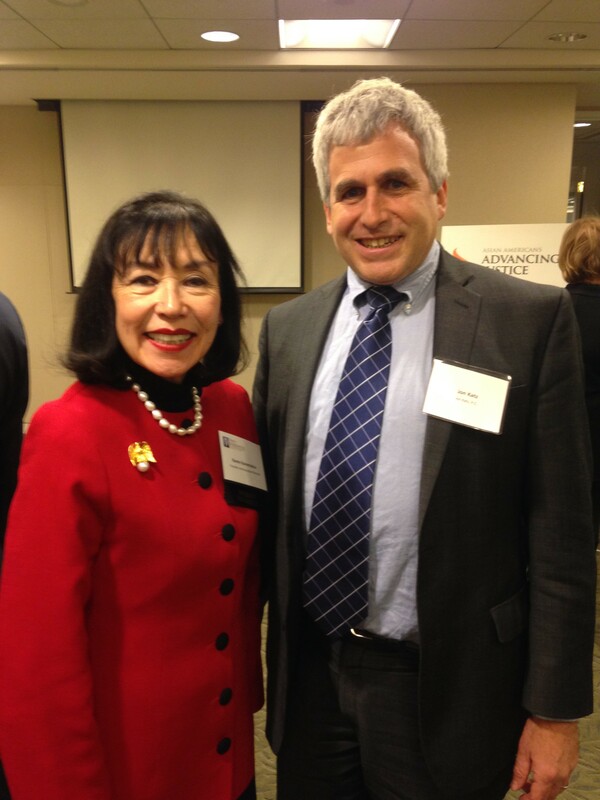 Karen told me briefly about the work of the Fred Korematsu Institute. I gave her an origami peace crane that I had recently folded; the peace crane is represented in a sculpture at the National Japanese American Memorial in Washington, D.C., and to me its wings represent transcending all obstacles and adversity. The event was at a big corporate law firm in McLean, Virginia, which is not unusual, because most large corporate law firms in the D.C. area have partners supporting numerous causes, including civil liberties causes. While there, I spoke with staff from event co-sponsor Asian Americans Advancing Justice, Virginia state delegate Mark Keam — whom I first met in 1999 — who authored Virginia’s Fred Korematsu Day resolution, and Fairfax Circuit Judge John Tran, who has a compelling story of overcoming adversity including being stranded in Saigon when North Vietnam took over. One way to disintegrate racism is for people to see people of many ethnicities in all types of positions to the point where experiencing an African-American president, Asian-American judge, or Hispanic-American senator barely is notable for their ethnicity. The story of the American concentration camps for ethnic Japanese is not some mere history story nor only a story about racism towards ethnic Japanese and ethnic Asians. I agree with past Senator Daniel Inouye’s underlining in a talk at my college in 1981 that such an inhumane affront can happen again. We must not let it happen again.